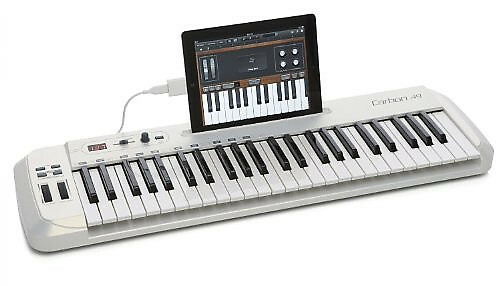 Samson's Carbon 49 USB MIDI Controller makes musical performance and production accessible to everyone. For seasoned musicians and young creators alike, the Carbon 49 offers versatile, easy-to-use features in a compact, lightweight controller that's well-suited for the stage and studio. The responsive and expressive platform that is designed to feel more like an instrument than a controller. Delivery is free on all orders within the 48 continental United States. Orders placed before 1:00pm pacific standard time are shipped the same day. If there are any problems/concerns regarding your order, it may be delayed. Our staff will contact you ASAP to expedite your shipment in a timely fashion. Note: Other shipping services such as Priority Mail, Express Mail or second and next overnight can be chosen at a fee. Transit time with standard shipping is three to seven business days, and the transit time with expedited shipping is one to three business days, depending on the method of expedited shipping that is selected. GoDpsMusic does not ship on weekends or holidays. GoDpsMusic reserves the right, in our sole discretion, to change our delivery policy and delivery fees. If there is a problem with your order, send an email through Reverb; please include your order number. In rare cases it's possible that a product has a manufacturing defect. If you believe you've received a defective product please email GoDpsMusic@go-dps.com. We will respond quickly with an RA (return authorization) number. If we determine the unit failed under warranty, within 30 days of purchase, we will cover shipping costs within the U.S. to replace the unit for you. We want you to be completely happy with your purchase from GoDpsMusic. If you are not satisfied with any product, you may return it for a refund of the purchase price, store credit, or exchange it for another product within 30 days from the shipping date of your order. 1. You may return any eligible product you have ordered from GoDpsMusic within 30 days from receipt of delivery of merchandise. 2. We are unable to accept returns of goods that are used and not in their original packaging. 3. The GoDpsMusic Customer Care team must receive and approve your return request. Once your request is received and approved, a return authorization number to cover shipping cost will not be provided. The shipping cost will be paid by the customer for any items returned. IMPORTANT: All non-defective returned merchandise is subject to a restocking charge of 20% which includes the initial freight charge that was covered by GoDpsMusic. All returned goods must be in our possession within 30 days to provide a refund or a reship of incorrect merchandise. 4. Refunds or GoDpsMusic Credits will be processed after the goods have been received and inspected. 5. We aim to process all returned within one (1) week of receipt. Should you have any questions about the status of your return or how to return an item, please contact our Customer Service Team through Email. 6. In the unlikely event that your order arrives damaged, you need to Email us with a photo image of the damage, if possible. You must Email US if there are any damaged items in your shipment within 48 hours of receiving your order. 7. If you believe you received an item in error or you received a defective item, please Email US so that we can assist you. Note: In rare circumstances, if a customer received the incorrect merchandise, we will issue a return authorization number and a pre-paid packaging label for you to use. All returned merchandise must be in our possession in order for us to reship merchandise. IMPORTANT: Please note that any item returned without an authorization number will not be processed. 8. All returns are subject to the discretion of GoDpsMusic. All sales are final for used gear, scratch and dent, open box and store display models. All instruments ship as is and no returns will be accepted. Store display models are still covered under original manufacturer’s warranty. All sales are final for Drumsticks, Instrument Strings, Harmonicas, Guitar Picks, Pickguards, Violin Accessories, Polish Cloths, Instrument Cleaners and Polishes, Cymbal Felts, Cymbal Sleeves, Cajon Pedal Cables, T-Shirts, Glasses, Posters, & Books and no returns will be accepted. Based on purchase price of $169.99 at 10% APR for 12 months. Excludes tax and shipping fees, to be calculated at checkout. Rates range from 10-30% APR. Choose from 3, 6, or 12 monthly payments.